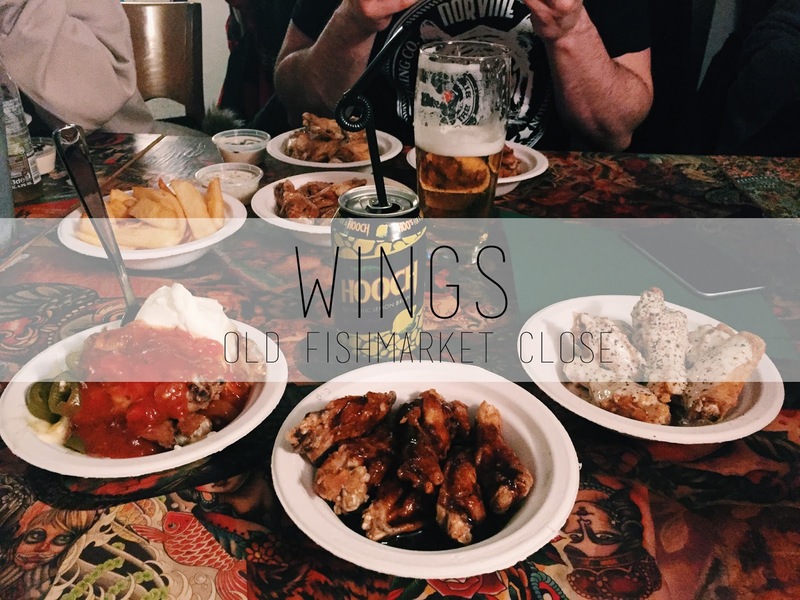 If you're looking for one of Edinburgh's most unique and memorable places to eat then look no further than Wings (warning: if you don't like chicken wings... maybe just give this place a miss? I mean come on it's in the name...). Hidden just off the Royal Mile down Old Fishmarket Close, Wings is often missed by most, which is ironic considering on the inside it features some of the loudest décor you'll ever see in a restaurant. The décor and ambiance is by far one of the highlights about a visit to Wings as the entire restaurant is crowded with pop culture references through posters, decorations, drawings, etc. From the C-3PO that informs you that you should wait to be seated for all 'human-chicken wing relations', to the massive tyrannosaurus rex head sticking out over one of the tables to terrify you, to the entertaining 'Where's Wally' table where you'll spend hours searching for Wally – wherever you're sat in Wings there is something to look at and keep yourself and your friends talking. The range of the geek-themed décor is pretty extensive covering the movies and TV everyone loves to the obscure – my personal favourite reference is the picture of Goldmember from Austin Power exclaiming 'I love Gold' near the tip jar. The highlight of a visit to Wings for me is downstairs section, where tables are accessorised with retro games consoles. These Nintendo 64s and Playstations aren't just for show, don't you worry! While you're waiting on your wings to arrive you and your friends can compete in a little game of Mario Kart. It's loads of fun in small groups – you start to completely forget you're in a restaurant! But let's get down to it – you came here to hear about the food after all. I'm sure this will come as no shock to anyone (I hope) but Wings pretty much only serves... wings. This doesn't mean they don't lack in variety as you have well over 70 different sauce and seasoning options to top your wings. These options are divided into sections, you've got your 'dry as you like' for those that just want a bit of seasoning, 'sizzler' for the adventurous with spice, then 'BBQ', 'Sweet, 'Boozey' and 'Fresh' which feature a variety of different sauces. Some of my personal favourites include (note: I haven't yet tried any from the 'Sizzler' section as I'm a bit of a scaredy cat when it comes to spicy food) Gene Parmesan which is just Caesar and garlic parmesan, BBQ maple and Zebra Sauce. Last time I was there I opted for the Nacho wings – yes that's right wings covered in cheese, salsa, sour cream and jalapeños – and it was actually pretty decent. While I enjoy the wings you can tell they're not the highest quality, but for the price and the quantity you get (6 wings per plate for £4.20) they are pretty delicious. While I usually opt for 3 plates, 2 is definitely a filling enough meal. There are also chips and chicken nuggets for those who don't like bones, plus a pretty cheap drinks menu. Given the amount of options for sauces and toppings you really can please everyone – I mean, again, you probably can't please someone who doesn't eat chicken... but why are you still even reading this non-chicken lover? Wings is definitely one of my favourite places to go with a small group of friends for a laid-back after work meal. A couple of drinks, a couple plates of wings and a go on the old Nintendo 64 reliving my youth (I did after all state that the birthday I received my Pikachu N64 was the best birthday ever even though I had to go to school that day – high praise indeed). The décor is really cool and will have you wanting to visit again and again to try and catch every little hidden thing. On top of that you'll probably have a hard time picking what sauce to smother your wings in so you'll need to pop-in again to try the runners up.